THQ Nordic has been making a habit of reviving old franchises recently. With the announcement of Darksiders 3 in May, the release of older games in the THQ library like de Blob to Steam, and now picking up the Kickstarted revival of Aquanox, the company seems to have an interest in the past. 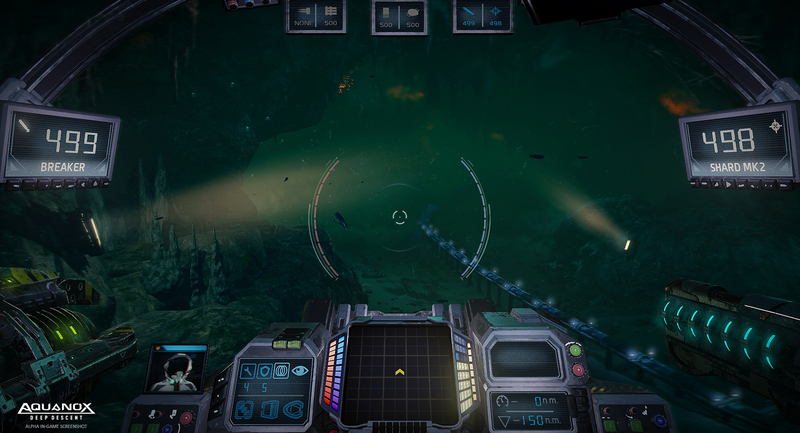 I got a chance to get a look at Aquanox: Deep Descent at E3, and while I’m not usually one for vehicular combat games, Aquanox seems potentially promising. Aquanox: Deep Descent has no ties to the original series, but its general premise and core principles remain. Aquanox is set in a world where humanity is forced to live underwater due to the declining state of the surface (thanks, climate change). Conflict over limited resources is constant, and is only getting worse as a mysterious force has begun to consume said resources further. The game takes place before the old games, looking to delve into how the human race ended up in its current predicament. The story follows four protagonists, each with their own strengths. The developers didn’t elaborate on those particular strengths, but they did say that certain characters are necessary per specific story missions, so it sounds like you’ll be able to swap between them. Otherwise you can play through the story mode cooperatively with up to three other players. The demo I was shown (and got to play) focused more on the multiplayer, however, to give a better sense of how its brand of vehicular combat works. You have three different classes of submarine to choose from: Scout, combat, and siege. Each has its own strengths and weaknesses. For instance, the scout class is fast and evasive, but its close range weapons and weaker armor put you at greater risk. Whereas the strength class is strong and can attack from a distance, but at the cost of mobility. I got a chance to give both a spin during a game of deathmatch. As nice as the combat ship’s ranged capabilities are – homing missiles and a sniper rifle-like gun – I ended up favoring the scout for its speed. Matches support up to four players, which feels like the right amount given the size of the maps and the pace of the game. I only played against bots, but they provided a good challenge, with both myself and them making use of the winding geography to our advantage. Despite that the game leans on the simulation side of things, it felt easy to get the hang of. The menus where I chose what submarine to use had a long list of stats that I’m sure will become important in the single-player portion of Aquanox, but I hope it won’t be too impenetrable as to be inaccessible for folks like myself. Aquanox: Deep Descent will be out later this year on PC, PlayStation 4, and Xbox One.